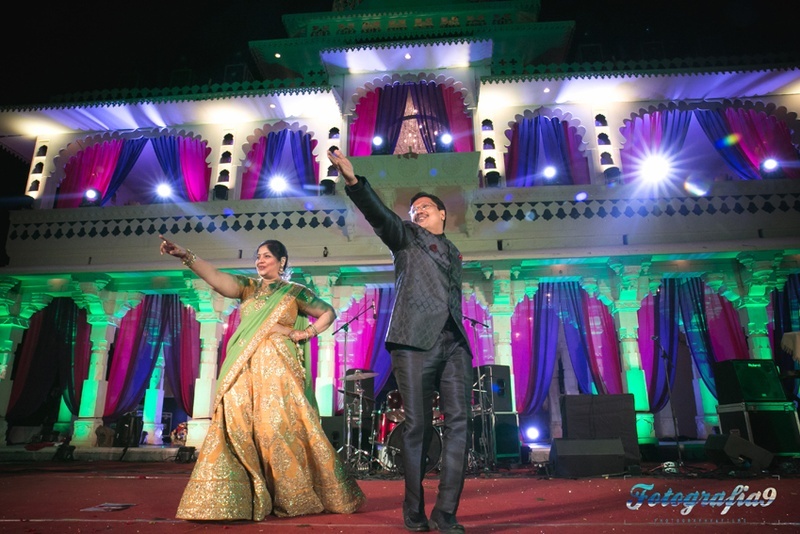 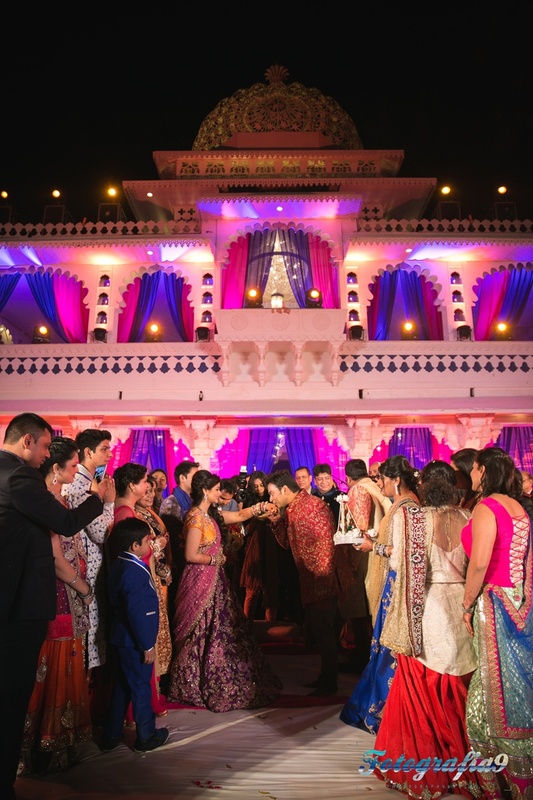 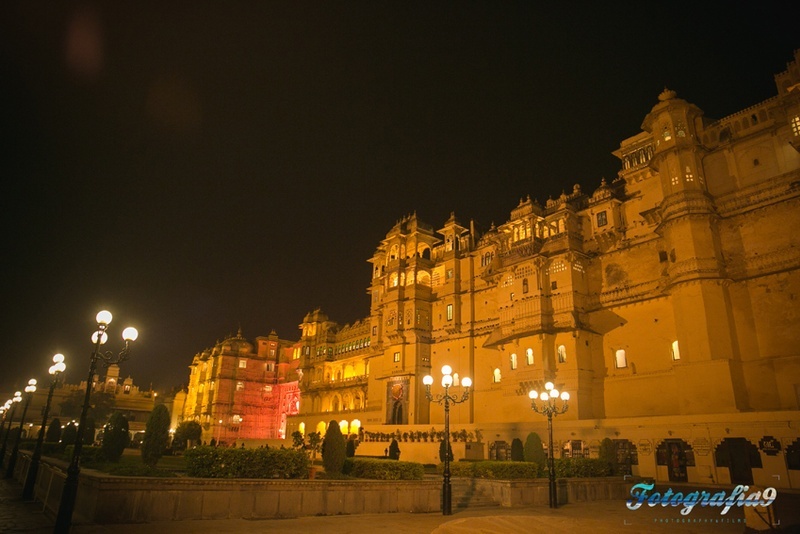 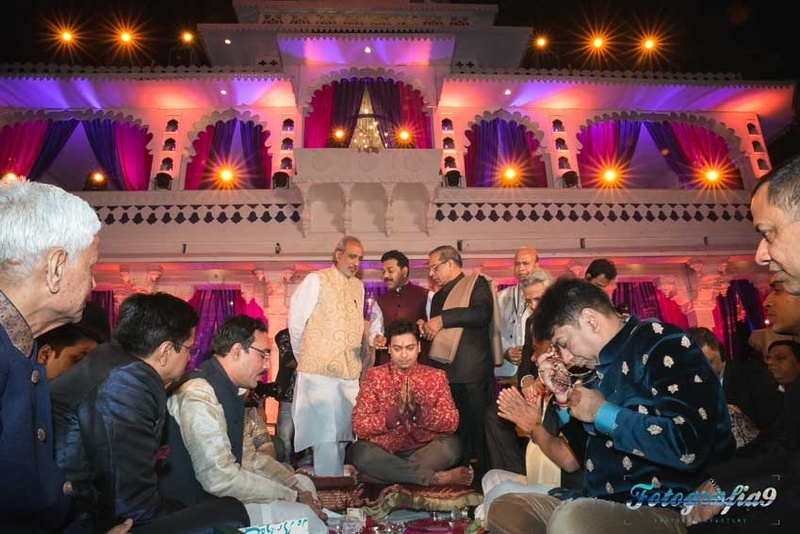 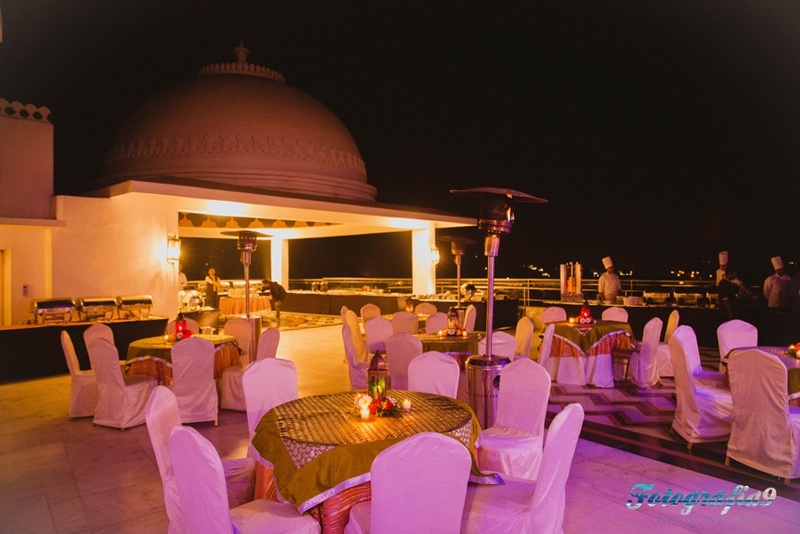 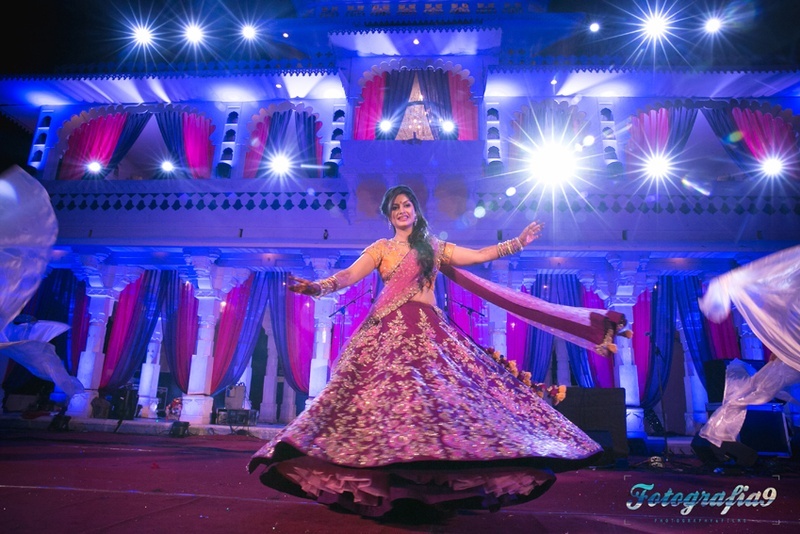 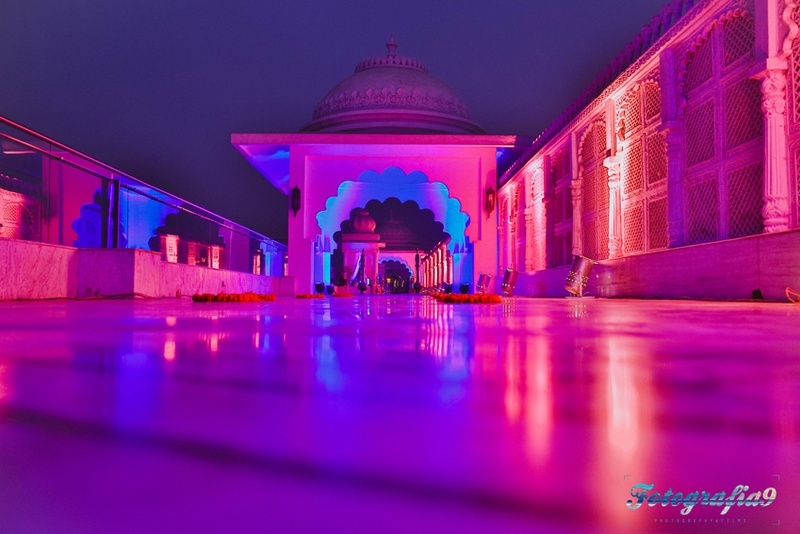 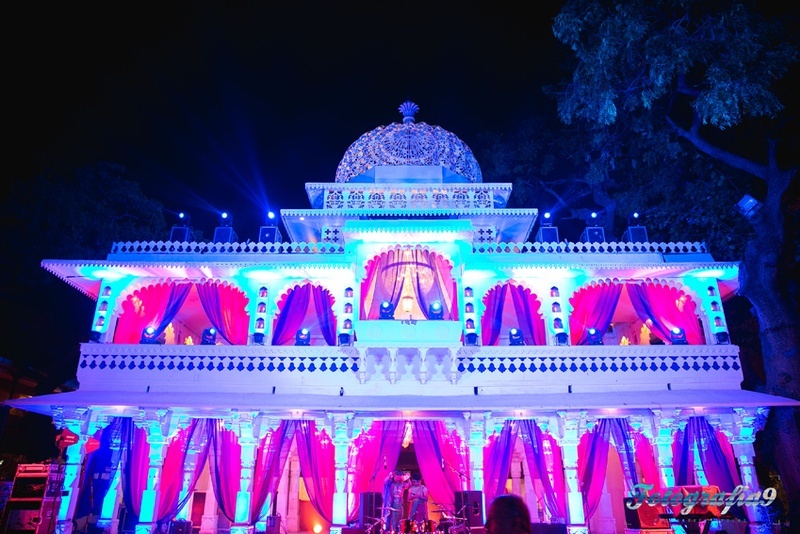 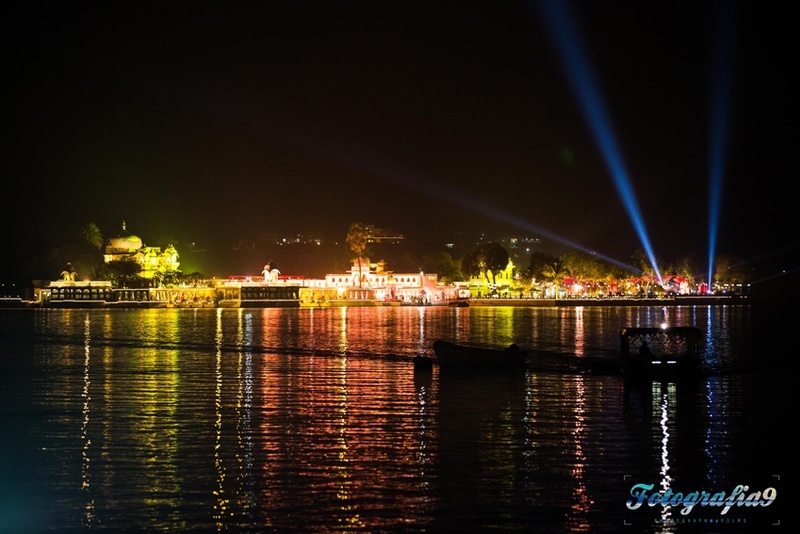 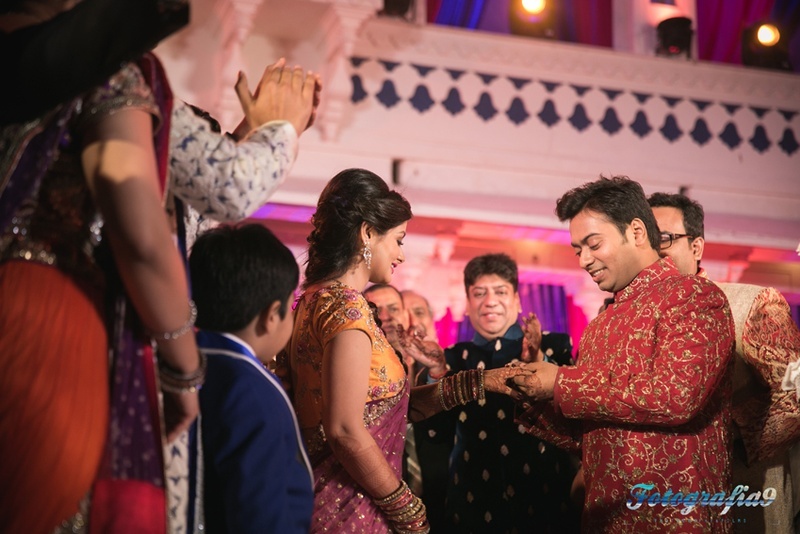 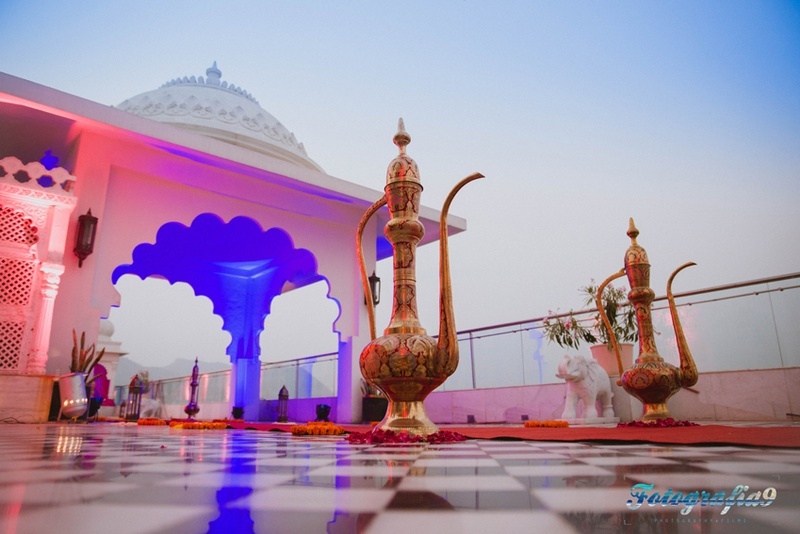 Any wedding held at the opulent Jagmandir, Udaipur just doesn’t disappoint. 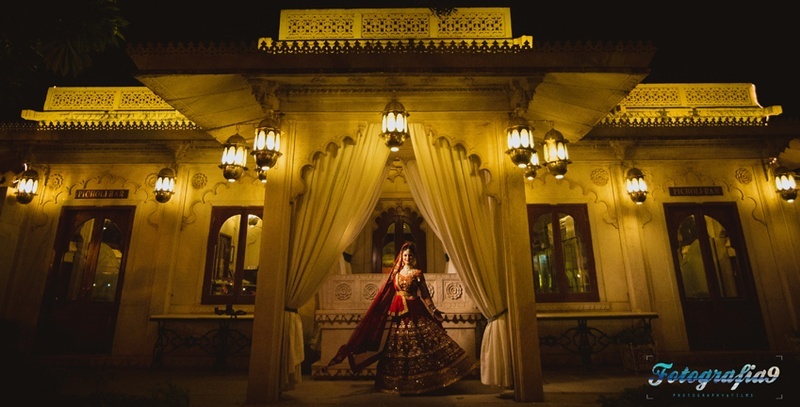 The beauty, the opulence and the grand feel of it all. 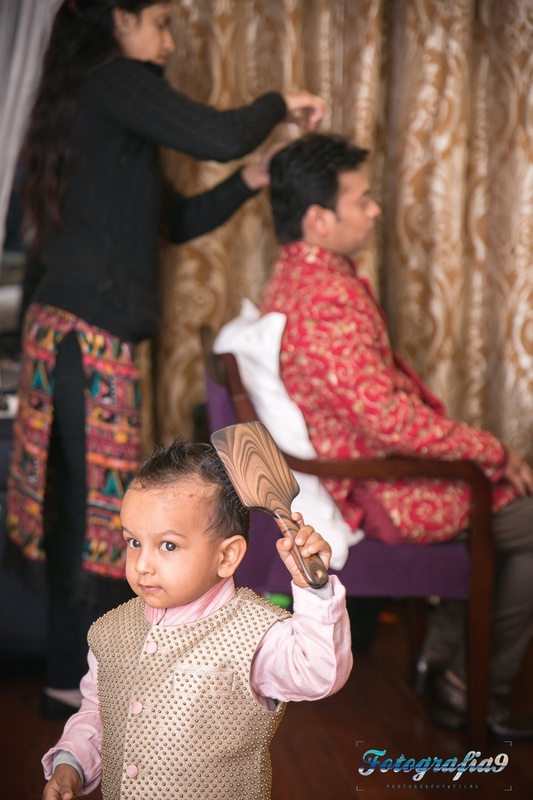 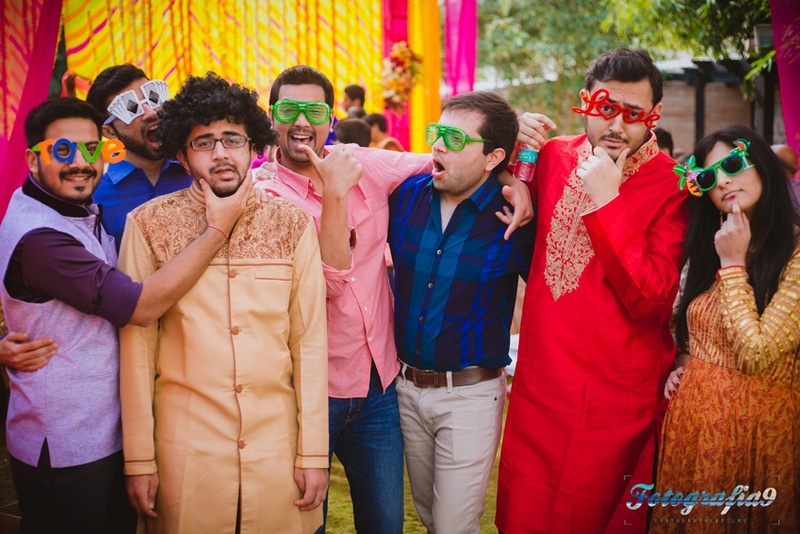 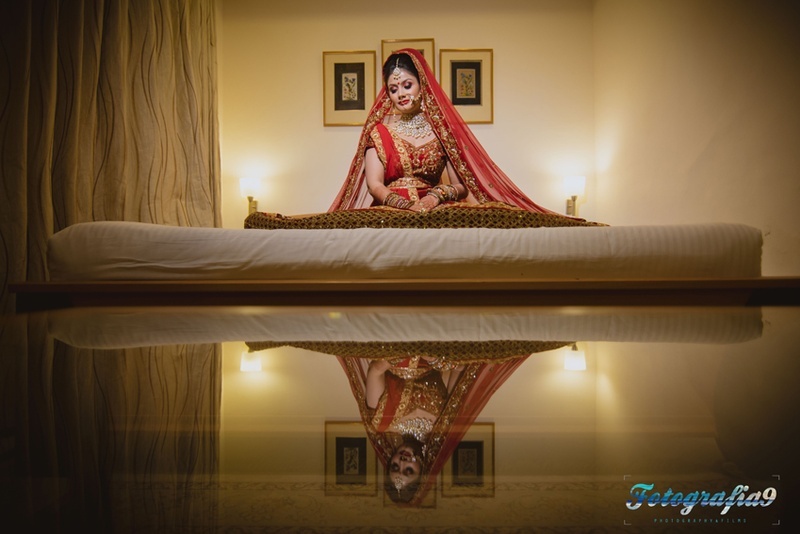 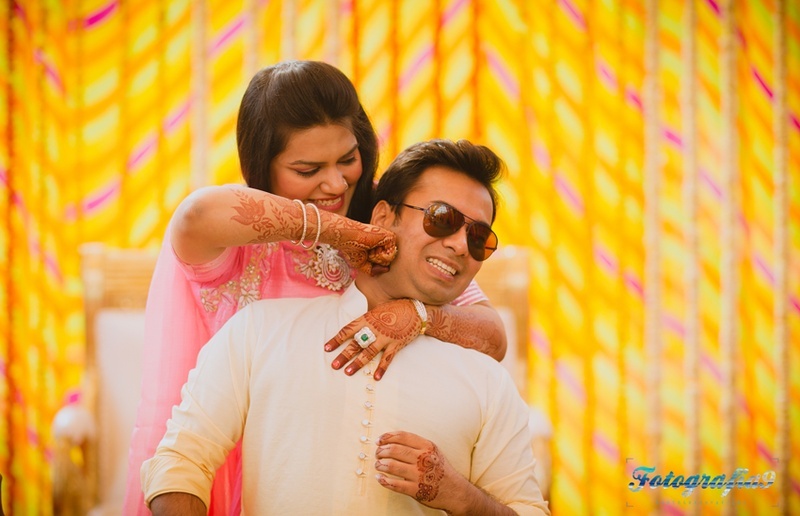 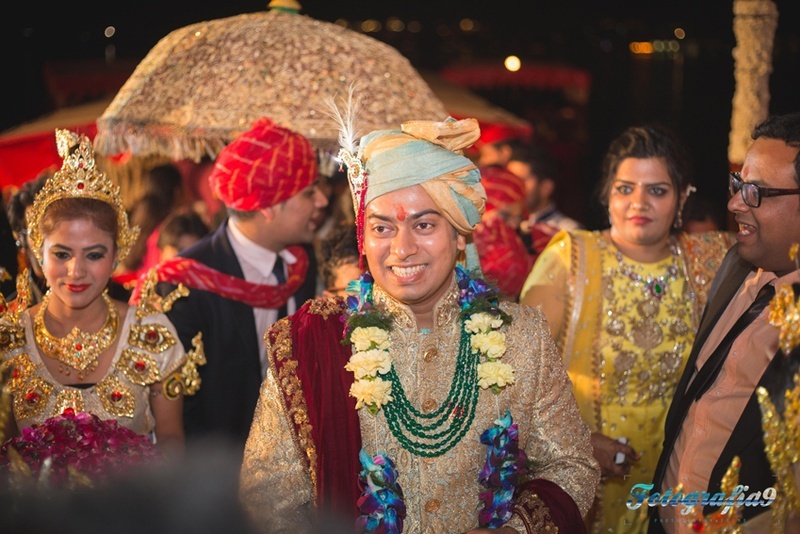 Each event from the pre-wedding photos to the wedding itself was full of happiness and love and every photo captured by the team at Fotografia9. 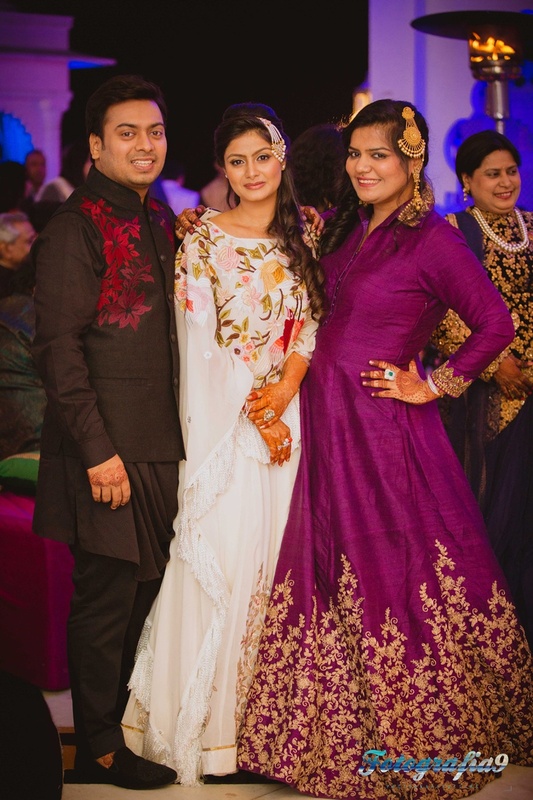 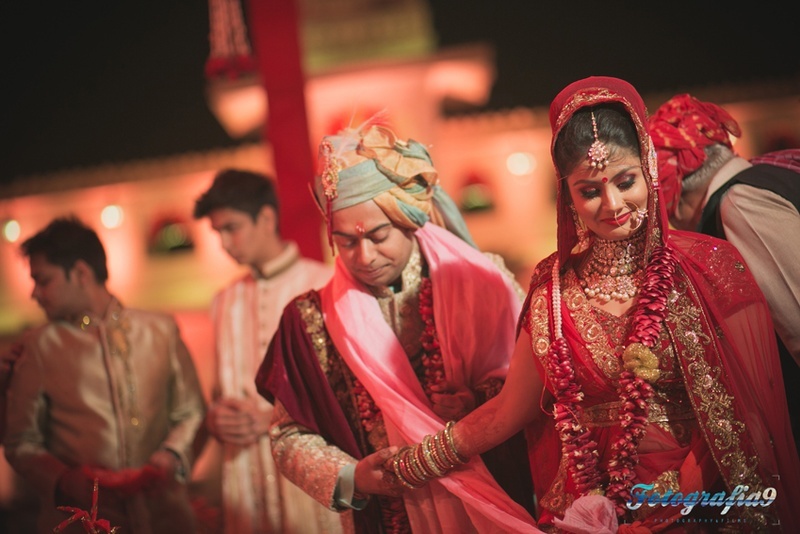 Celebrations began with the classy welcome dinner where our gorgeous bride, Pranita looked stunning in her white evening gown with floral embroidery covering the bodice beautifully. 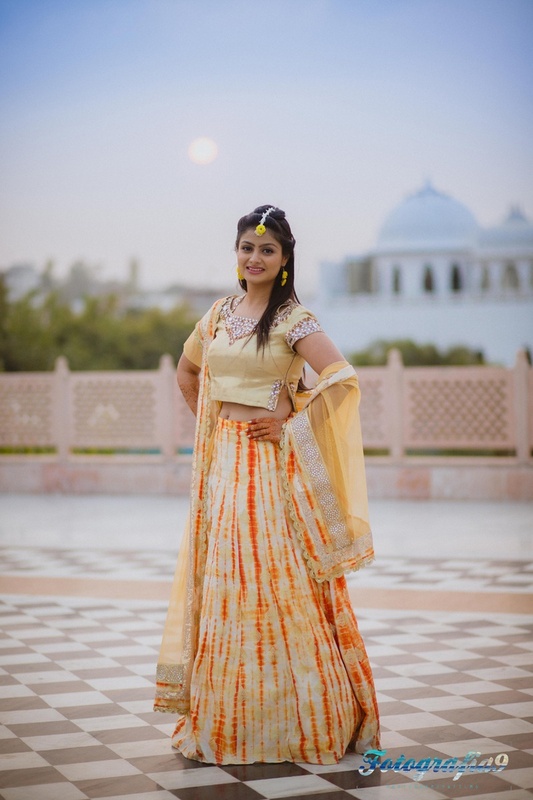 She paired this with an enamelled jhoomer that we just couldn’t get our eyes off! 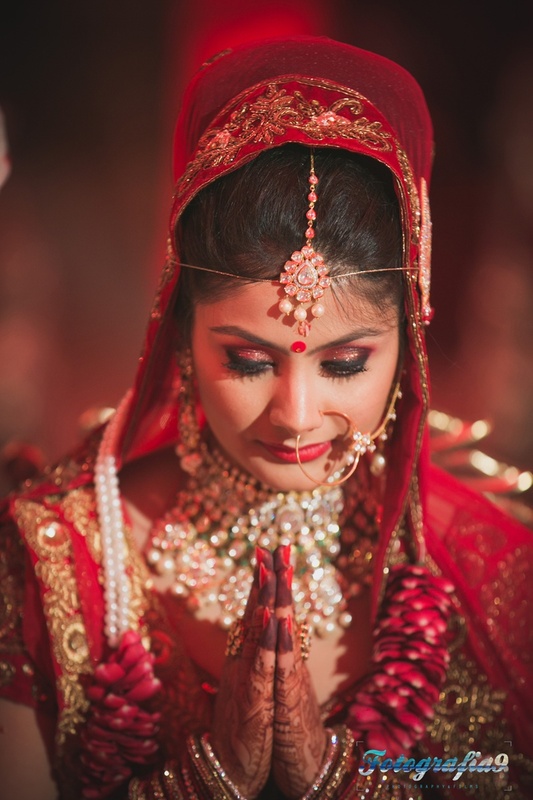 The colourful enamelling with floral designs set on a gold base with pearl drops was just the right kinda jewellery for that simple white gown. 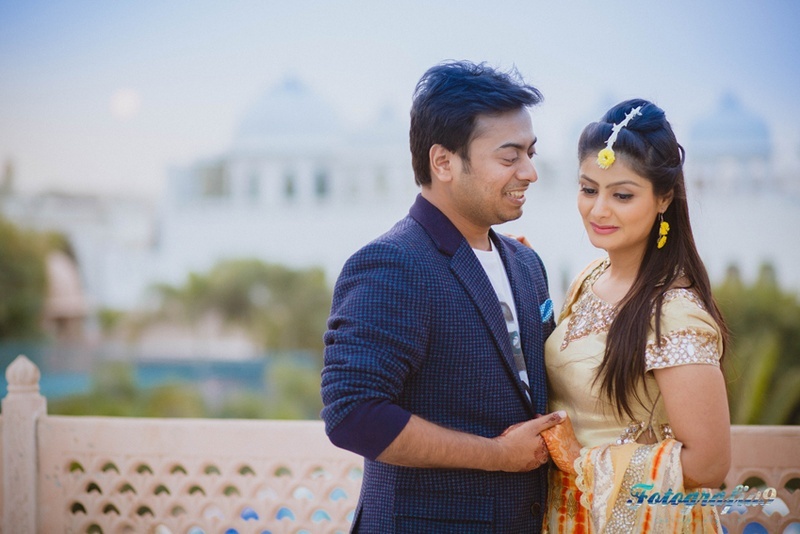 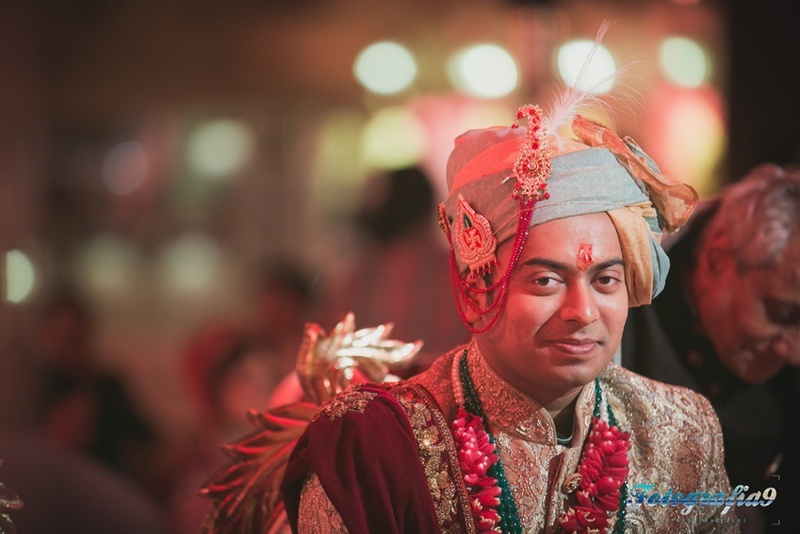 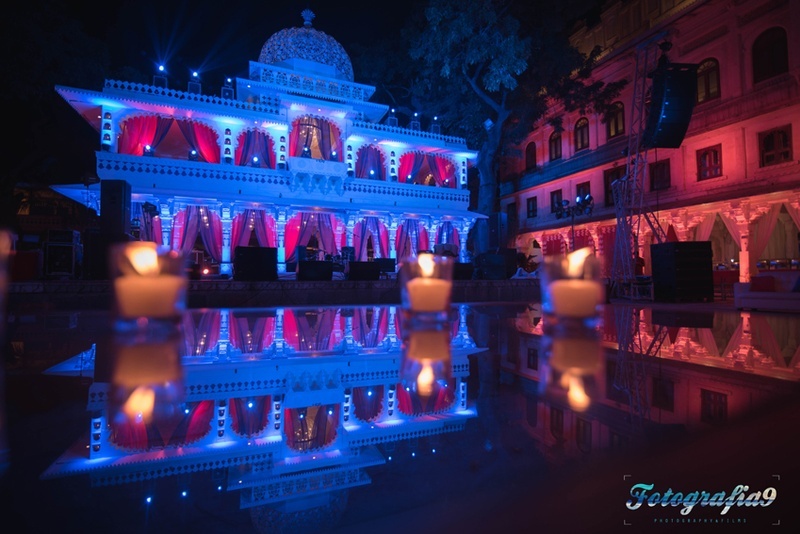 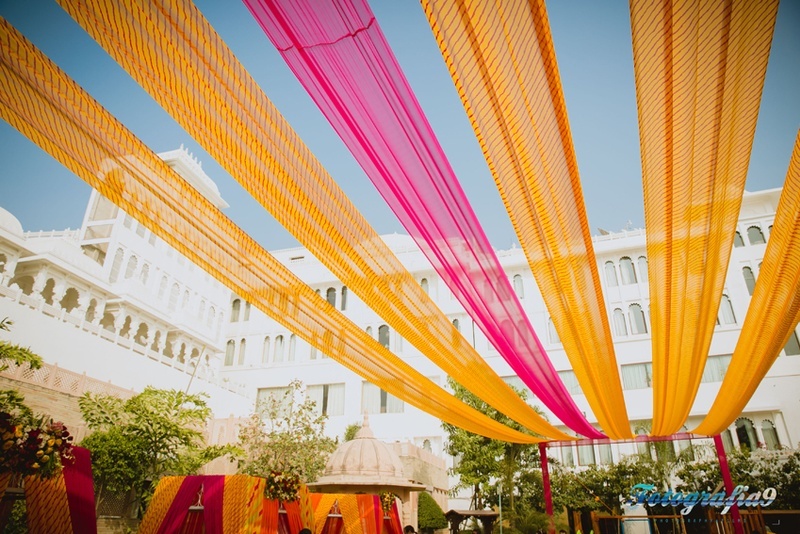 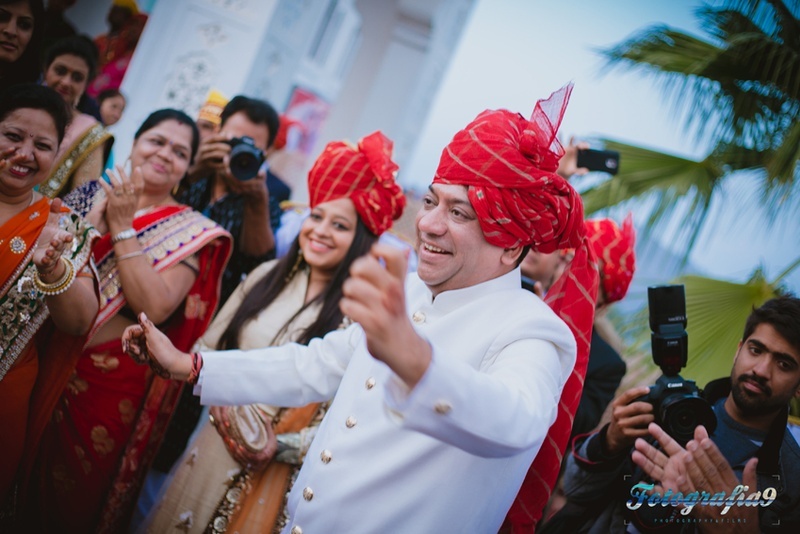 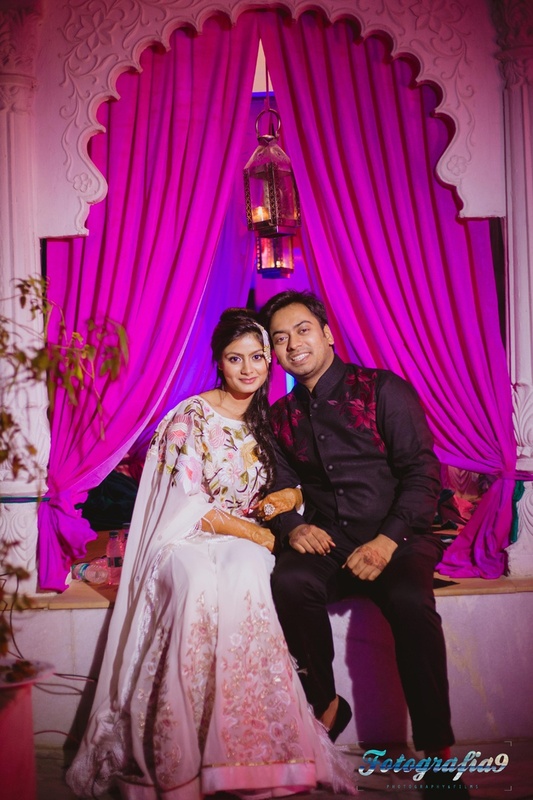 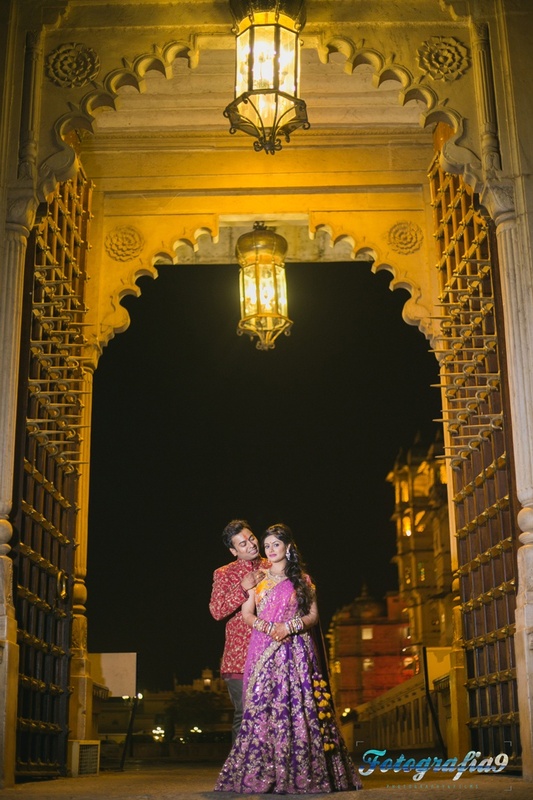 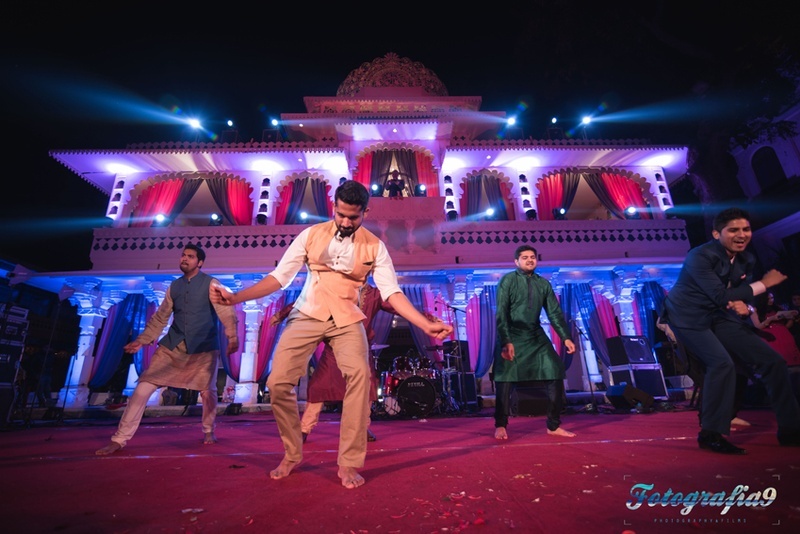 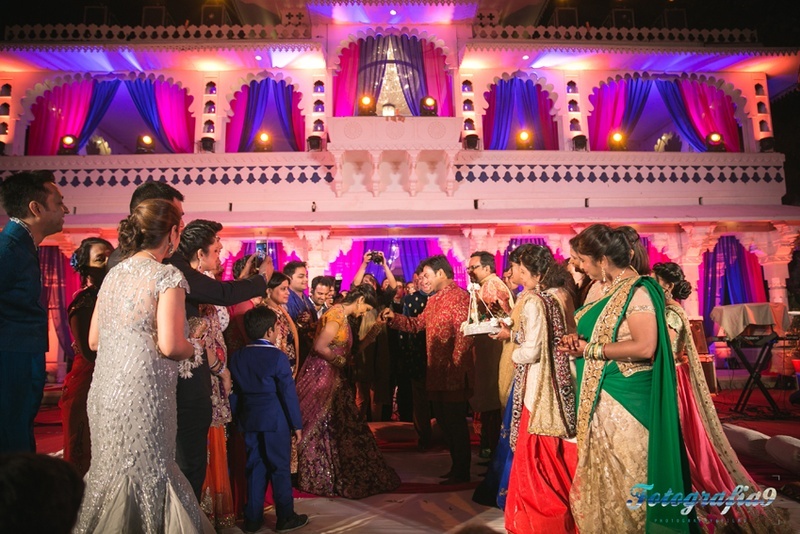 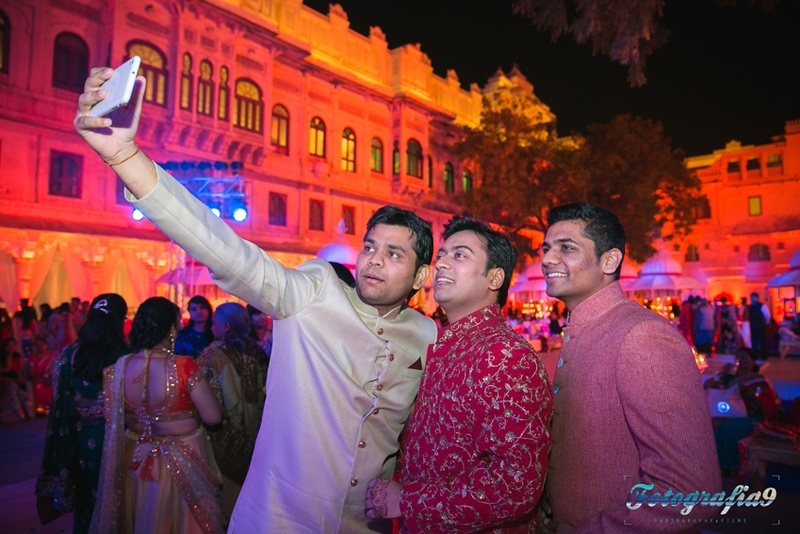 The grand Sangeet + Engagement ceremony followed where Pranita and Ankit’s wedding decorators recreated a backdrop that beautifully resembled the scalloped windows and dome roofs of Jagmandir, Udaipur for their sangeet. 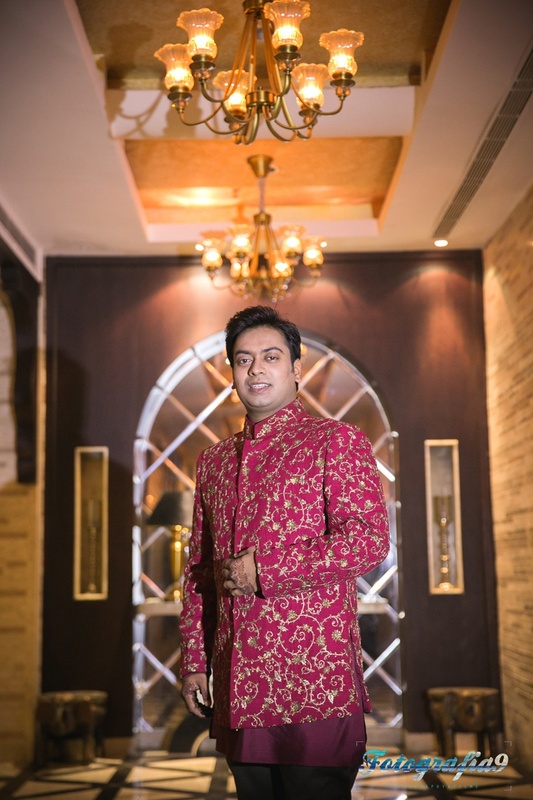 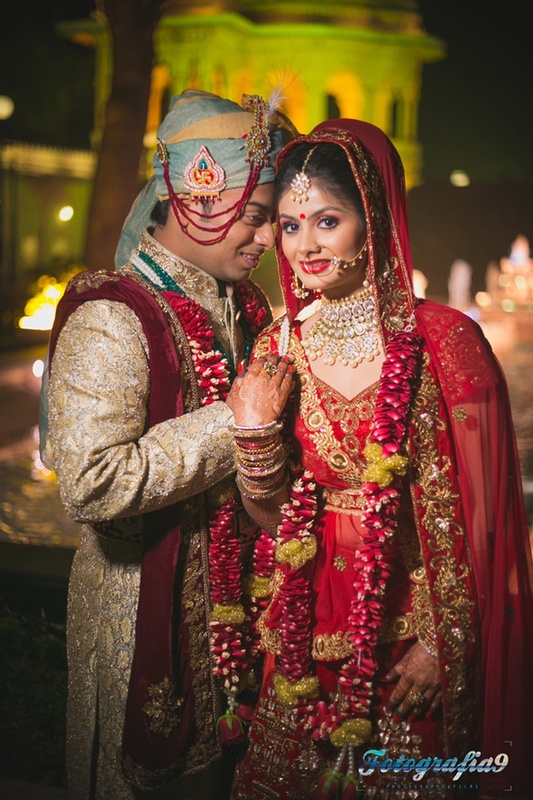 Pranita wore a classic resham embroidere Shymal and Bhumika lehenga while Ankit went for a combination of red and gold with his sherwani. 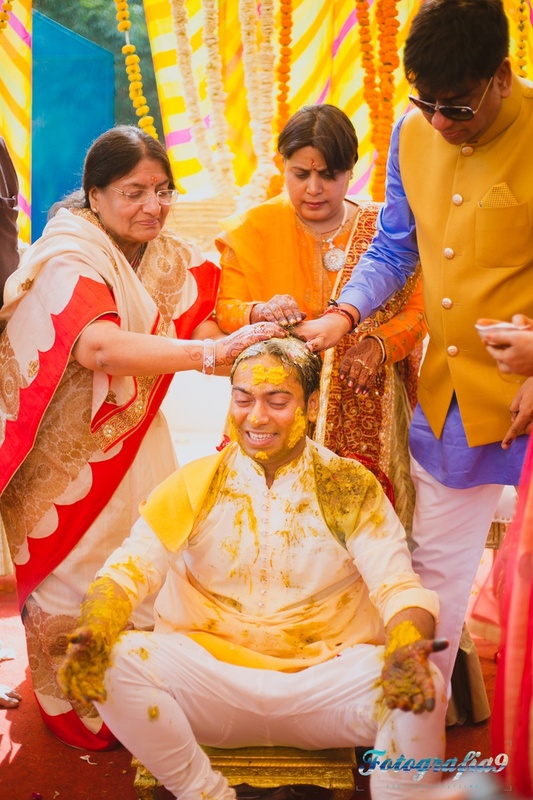 Their haldi set up was a sight to die for! 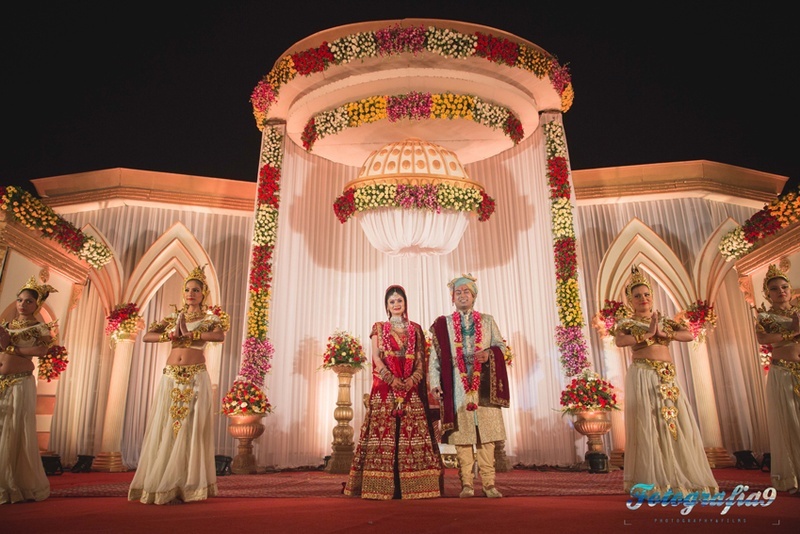 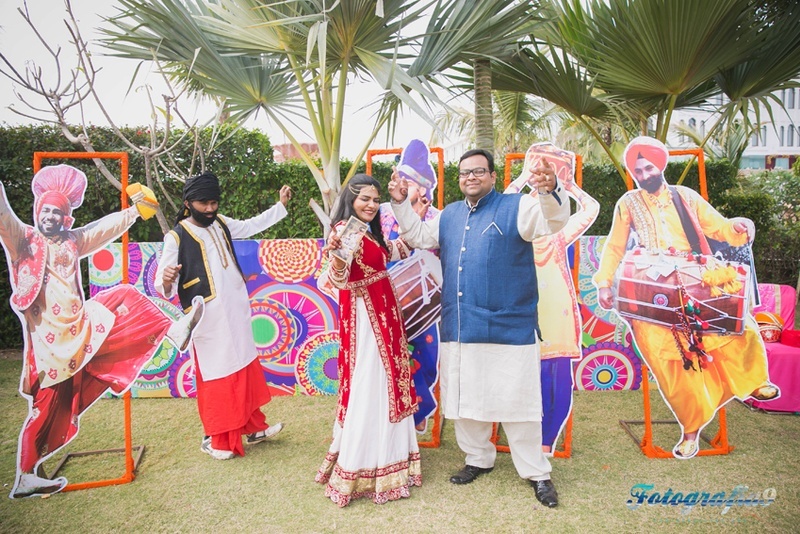 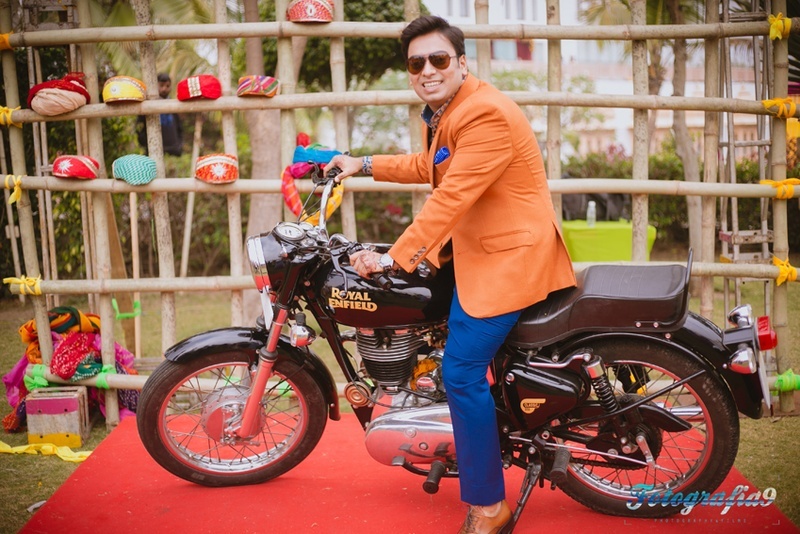 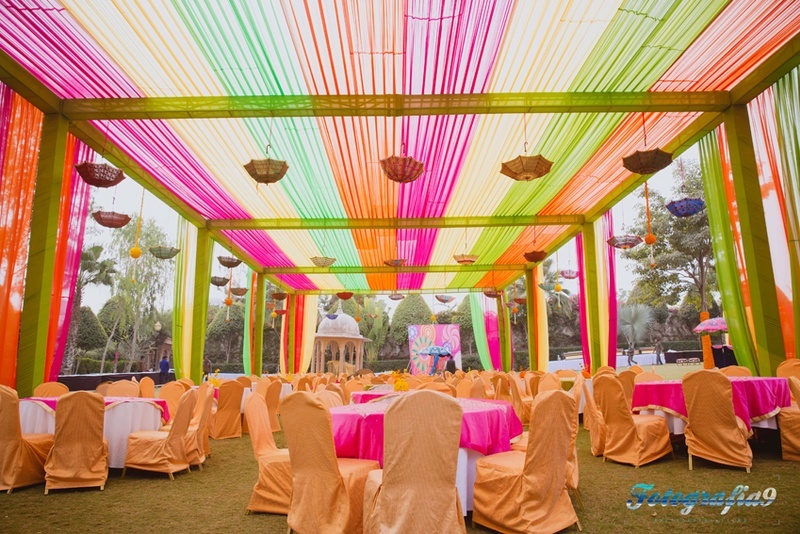 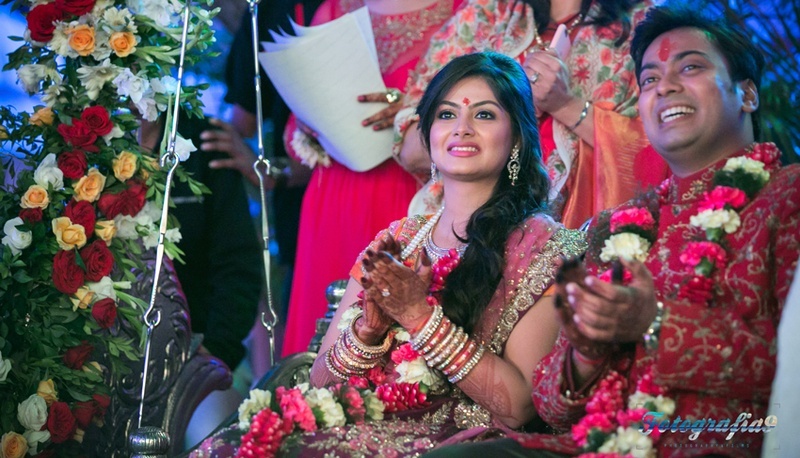 Upside-down ethnic umbrellas, leheriya drapes, and a Harley Davidson photo prop – talk about Big Fat Indian Weddings! 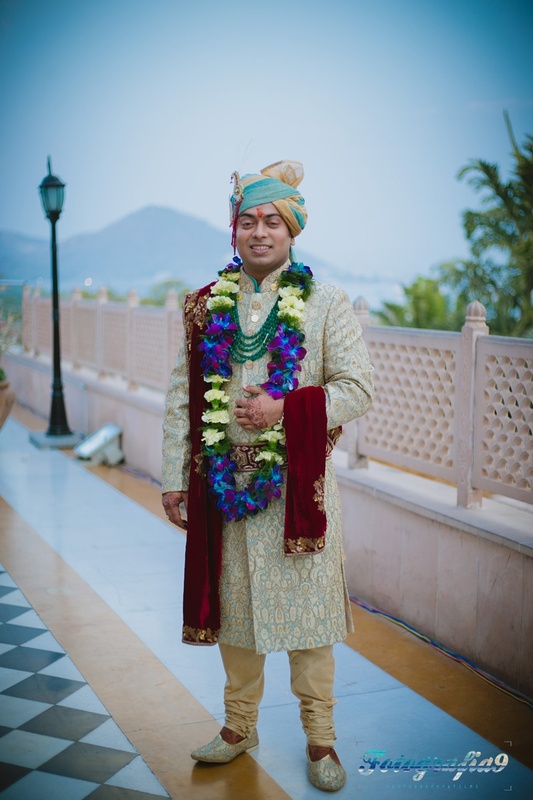 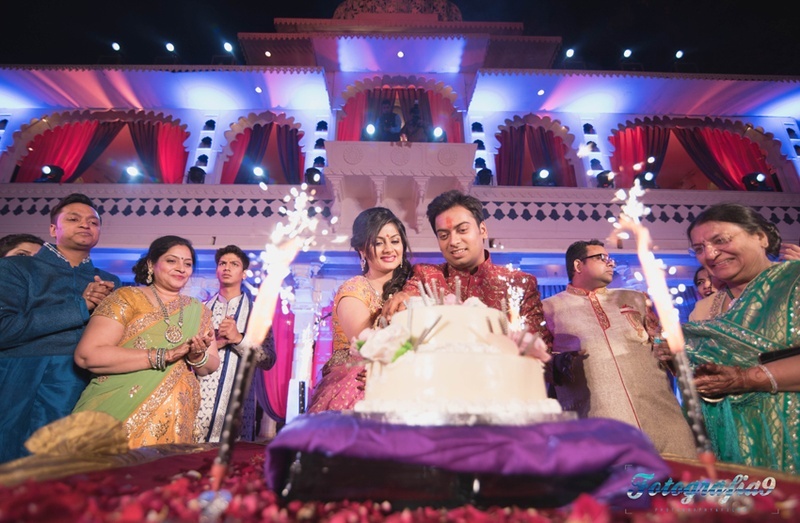 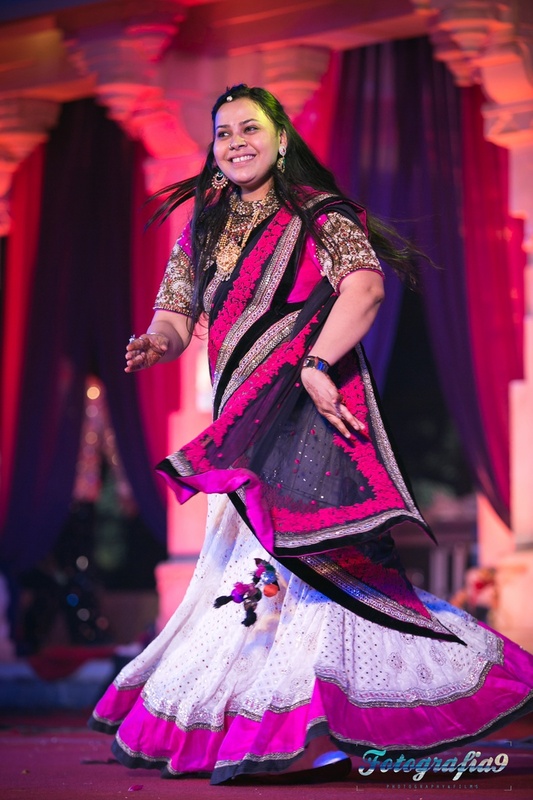 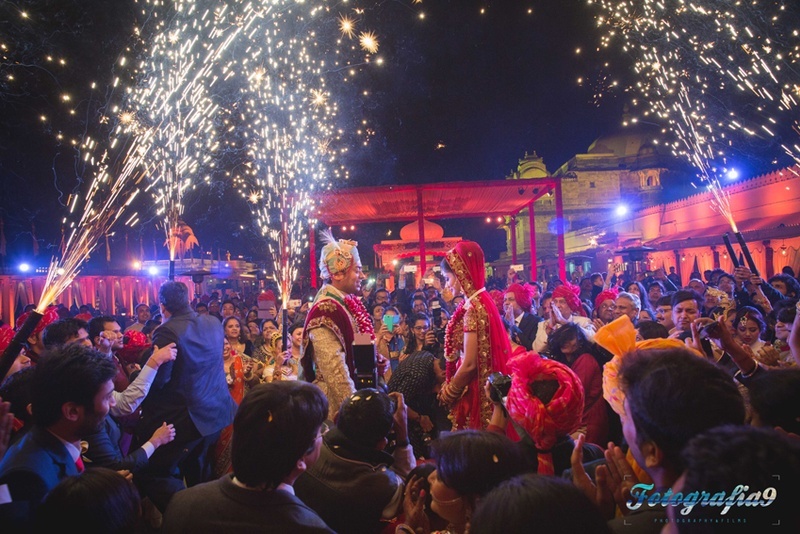 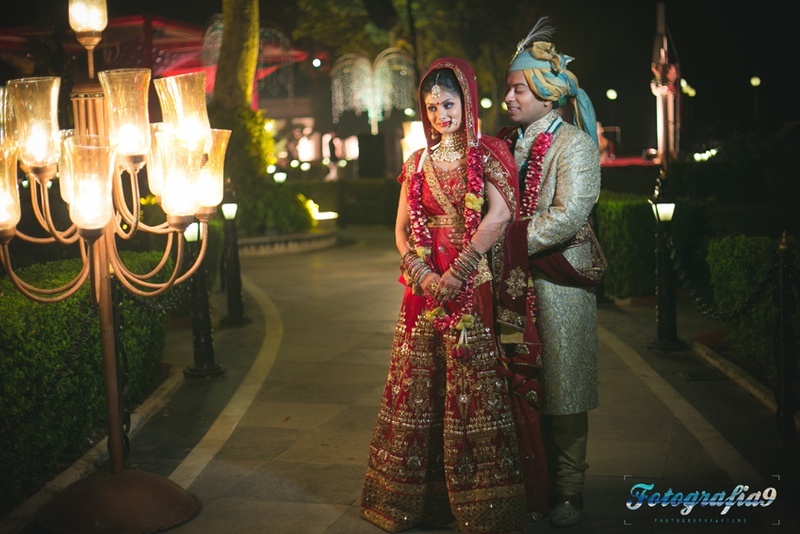 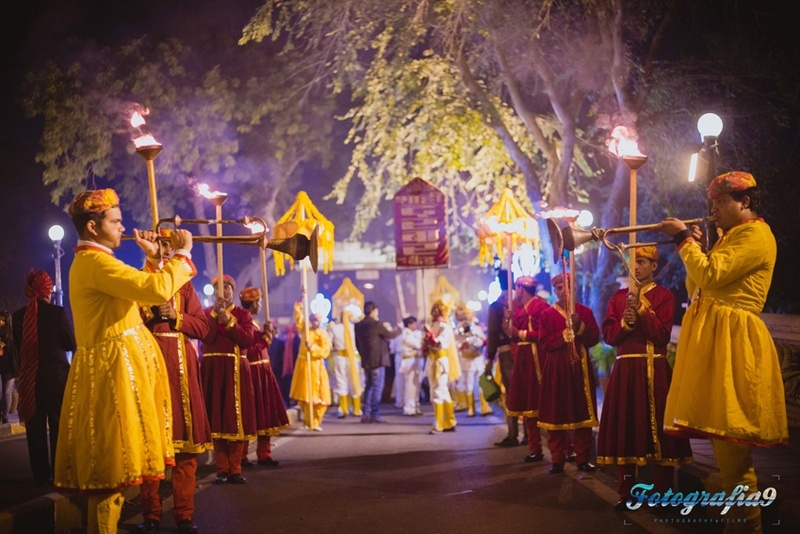 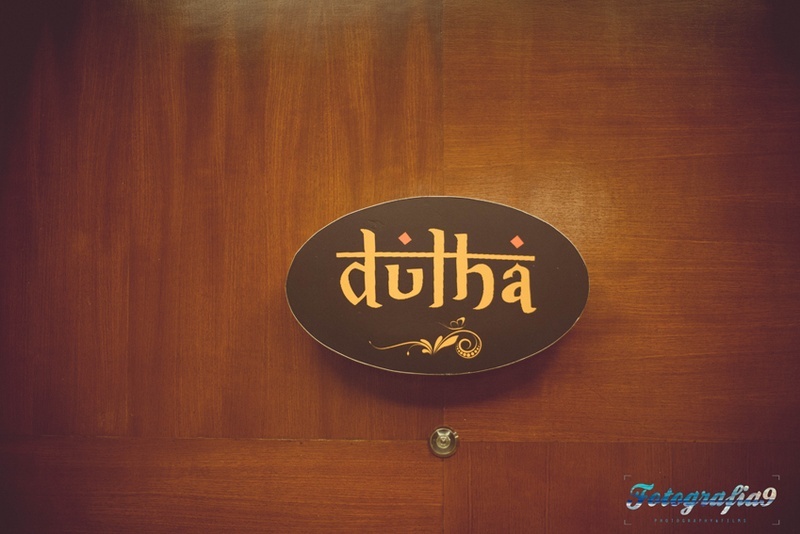 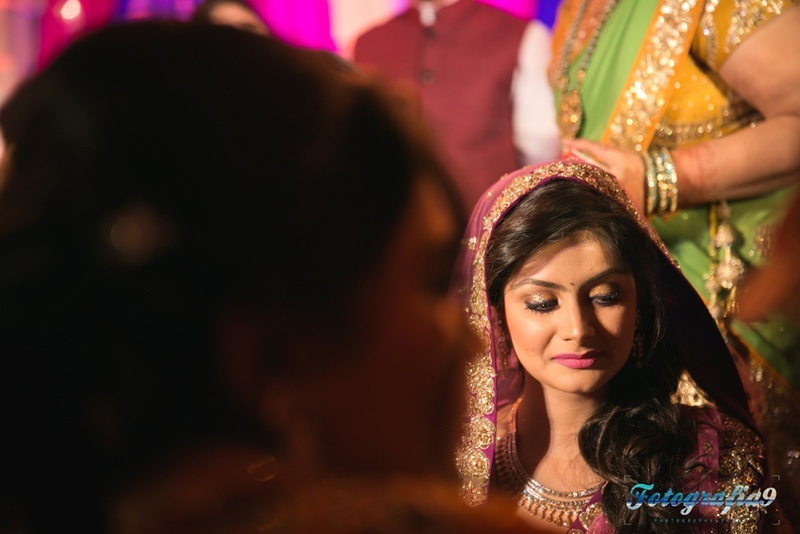 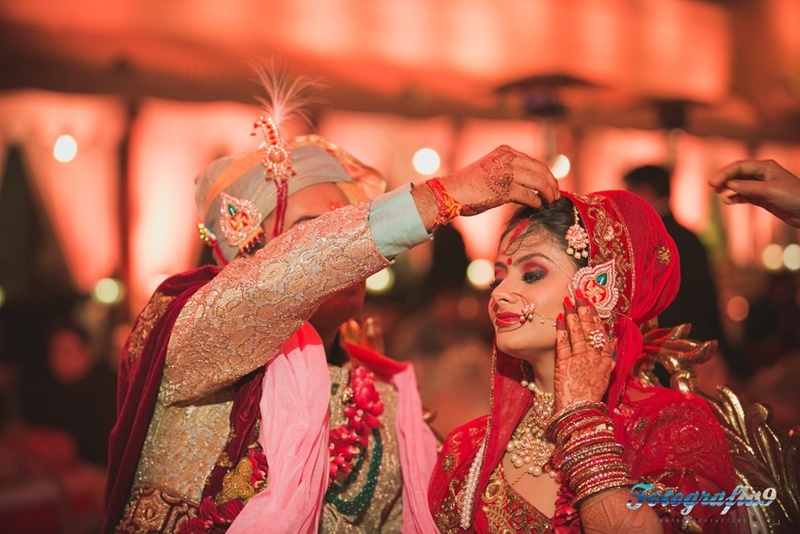 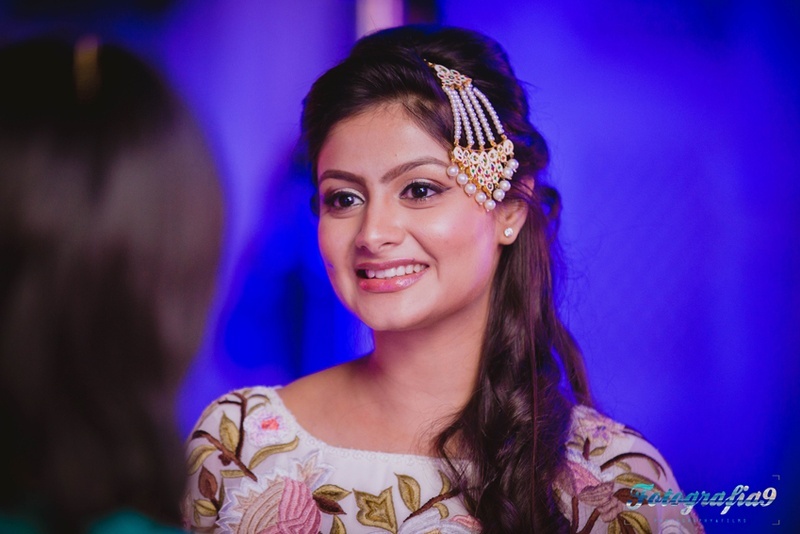 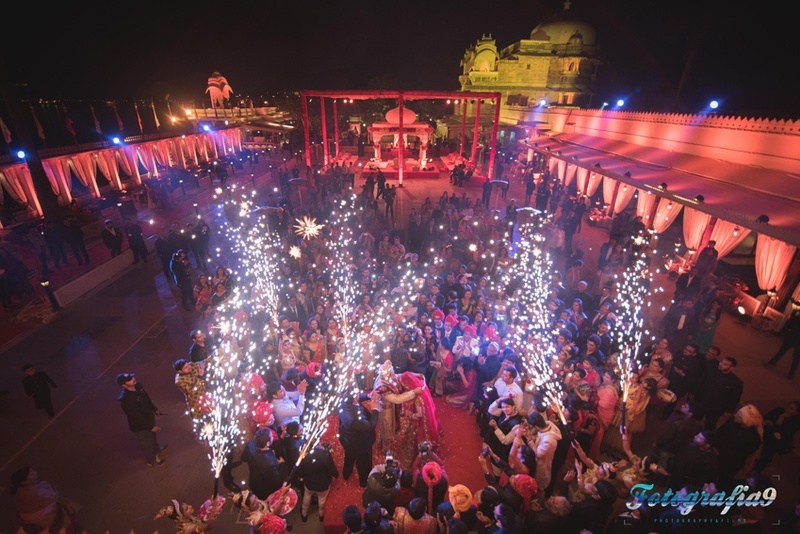 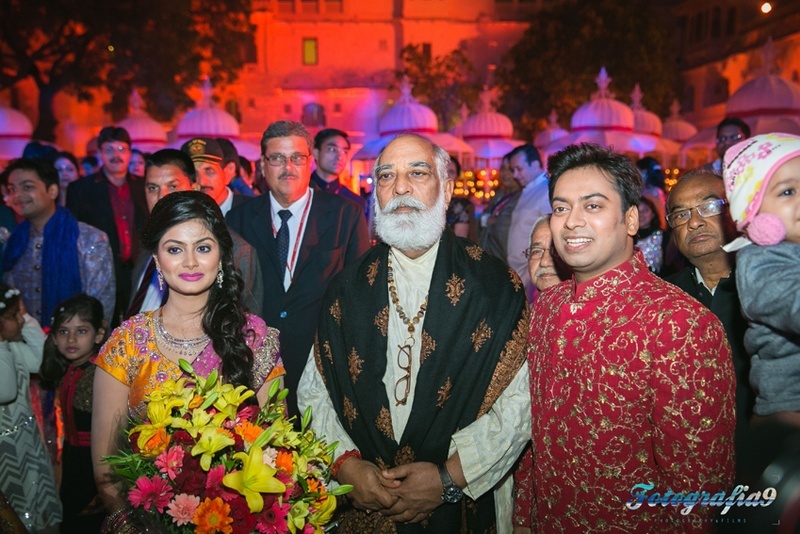 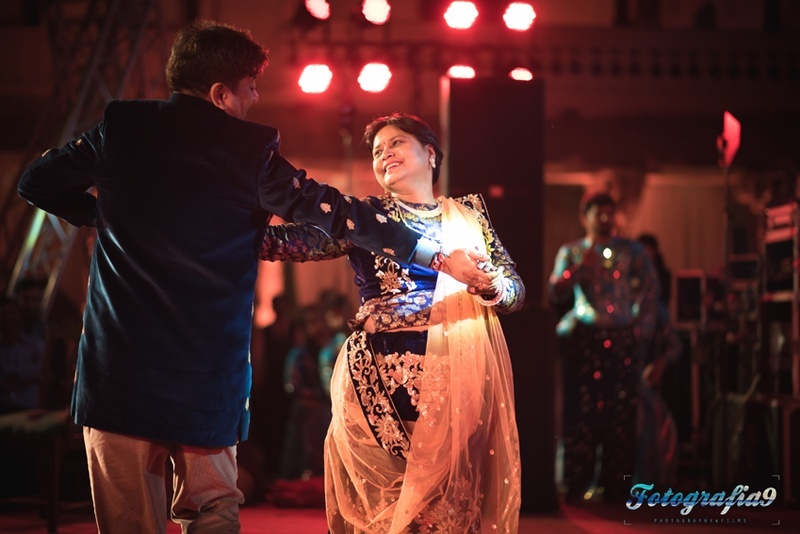 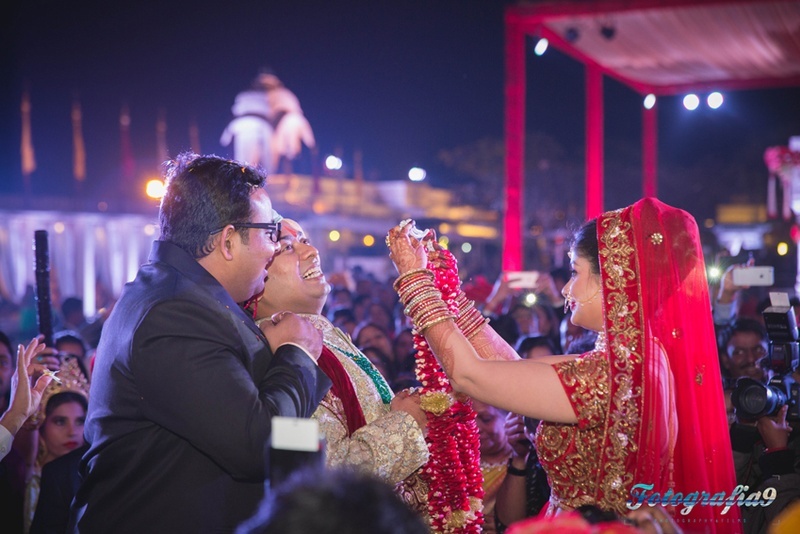 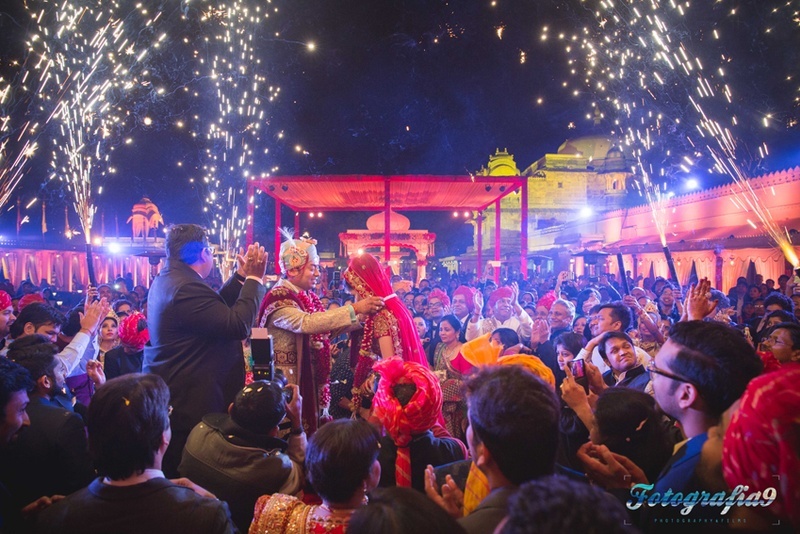 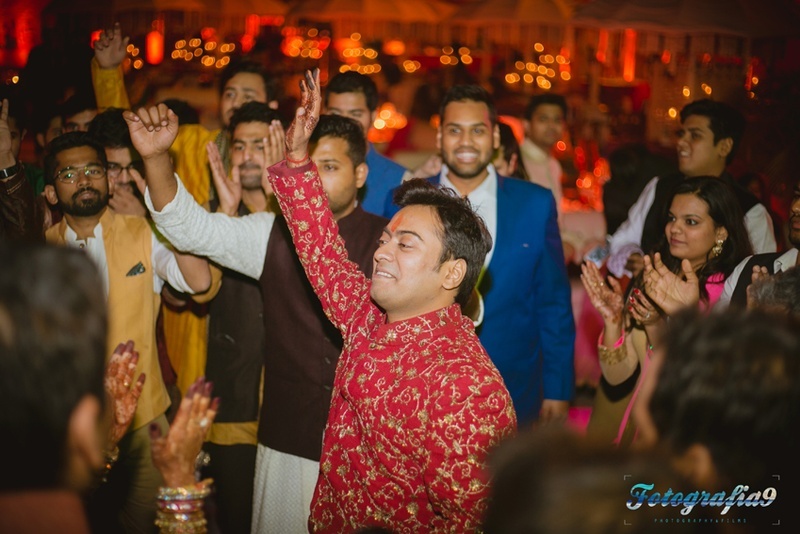 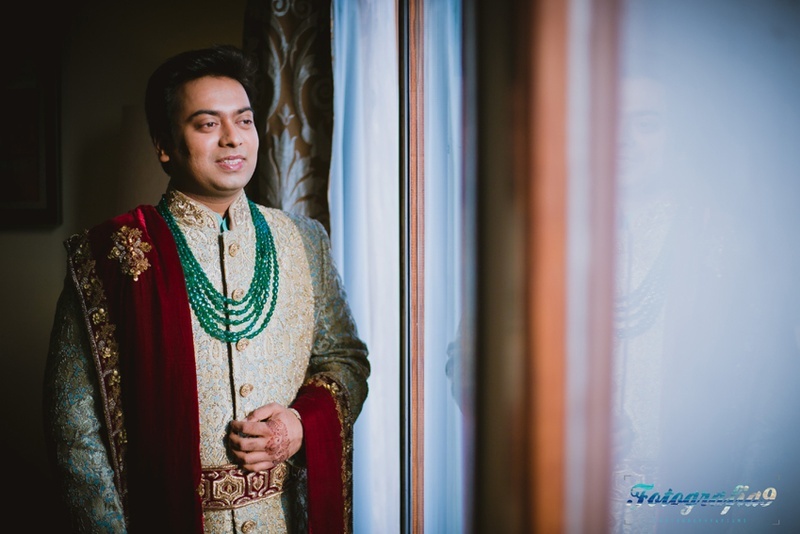 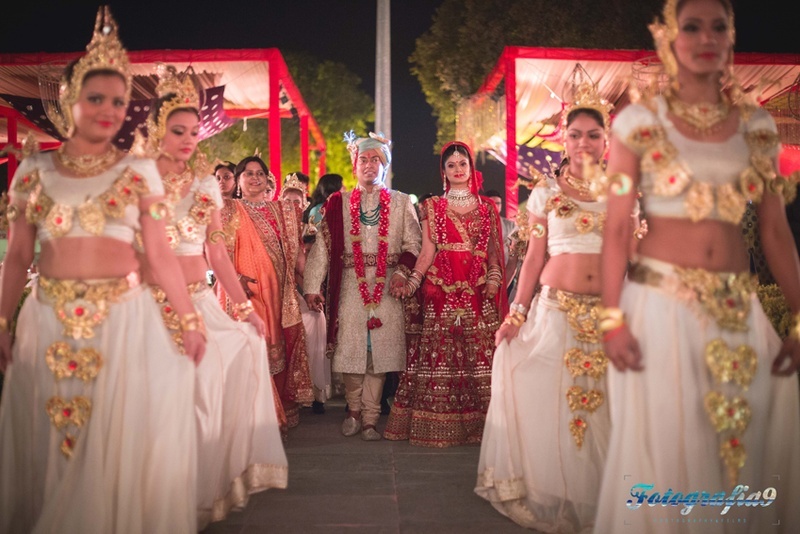 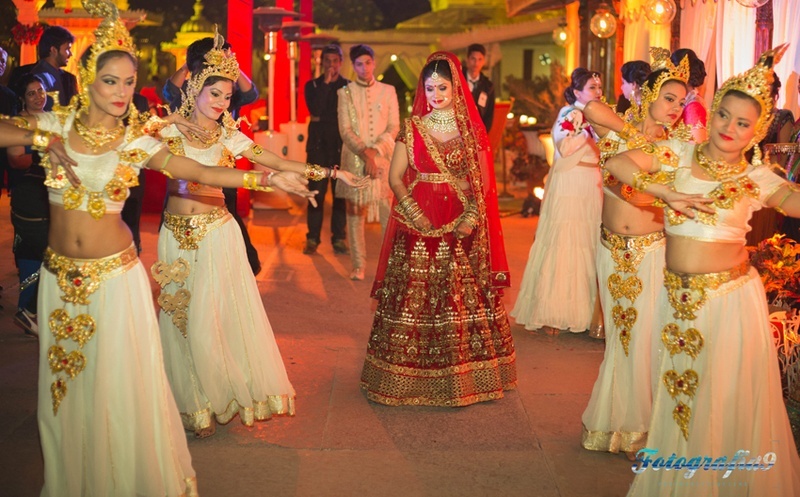 Their pheras too were all things dreamy – The beauty that began with the sparkler filled varmala continued up until their grand entrance at the reception. 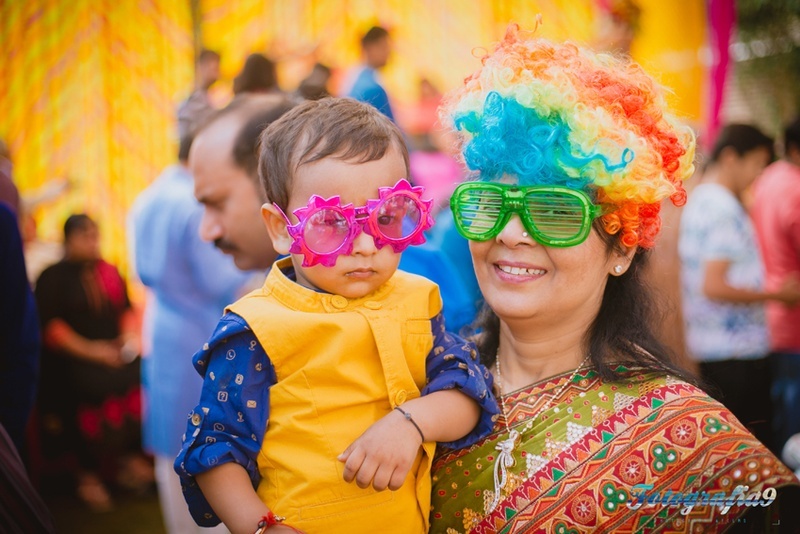 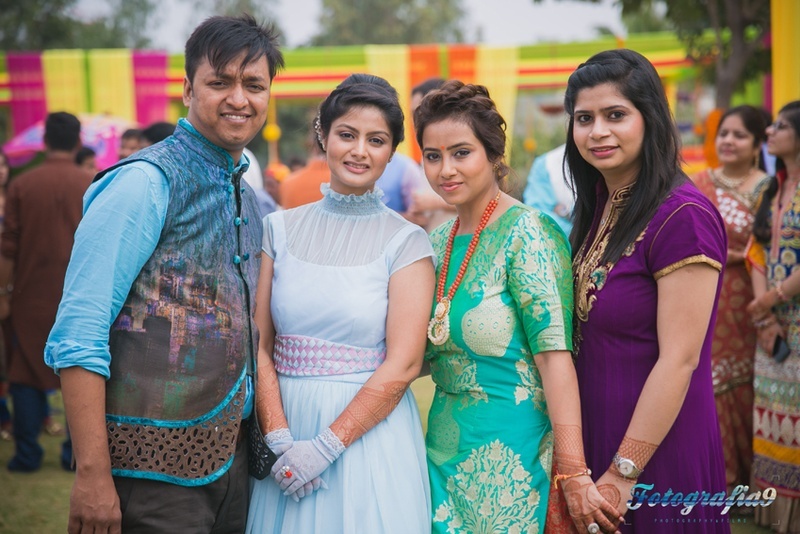 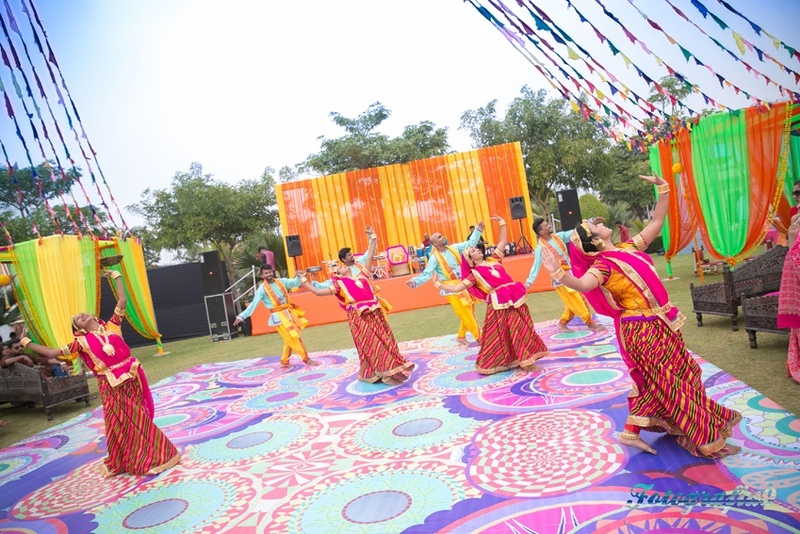 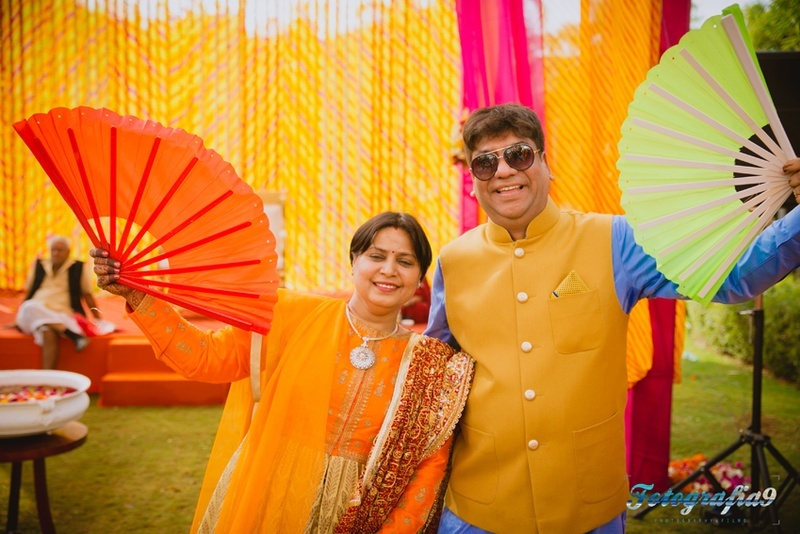 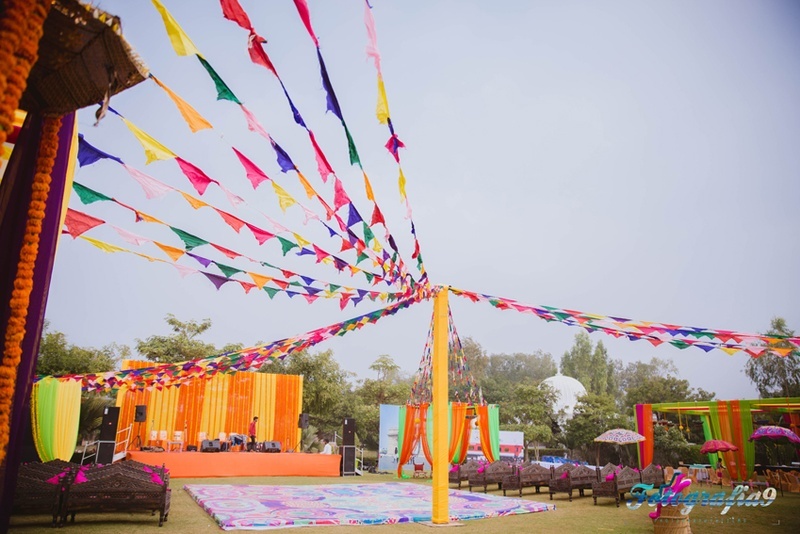 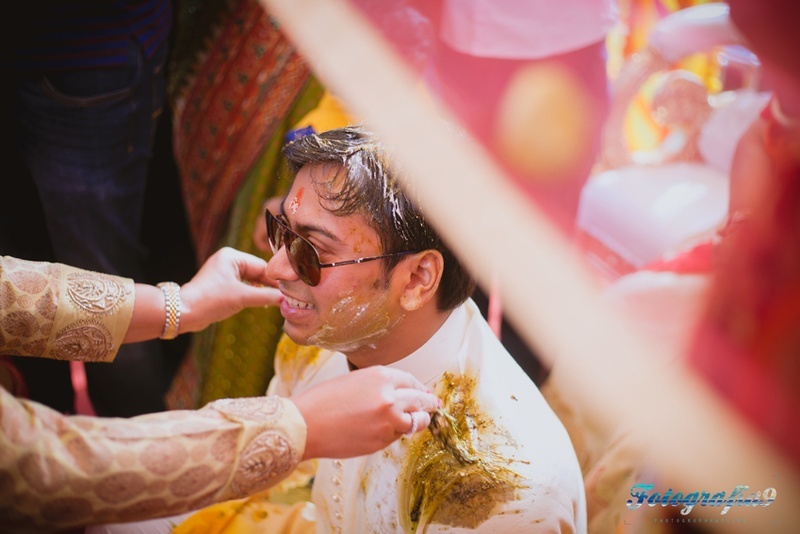 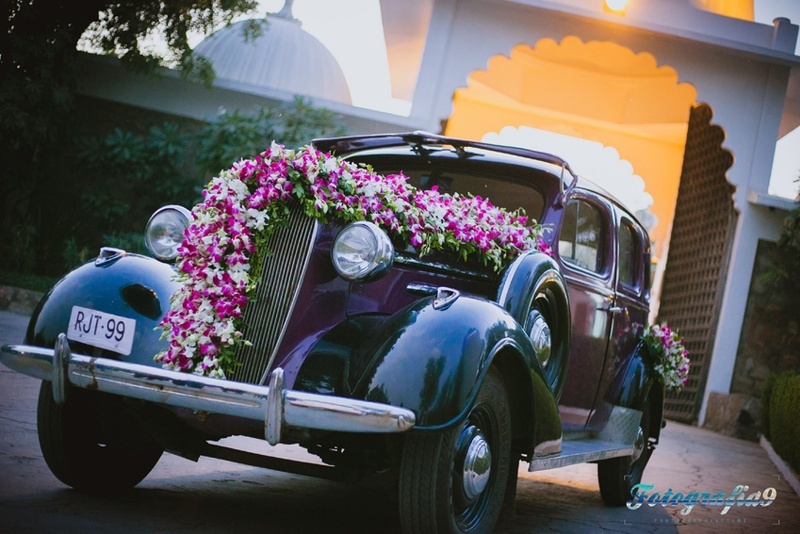 What to look out for as you scroll through this wedding – Pranita’s gorgeus yellow tie-dye lehenga, the vintage car, and the super fun balloon shooting game at the outdoor haldi ceremony! 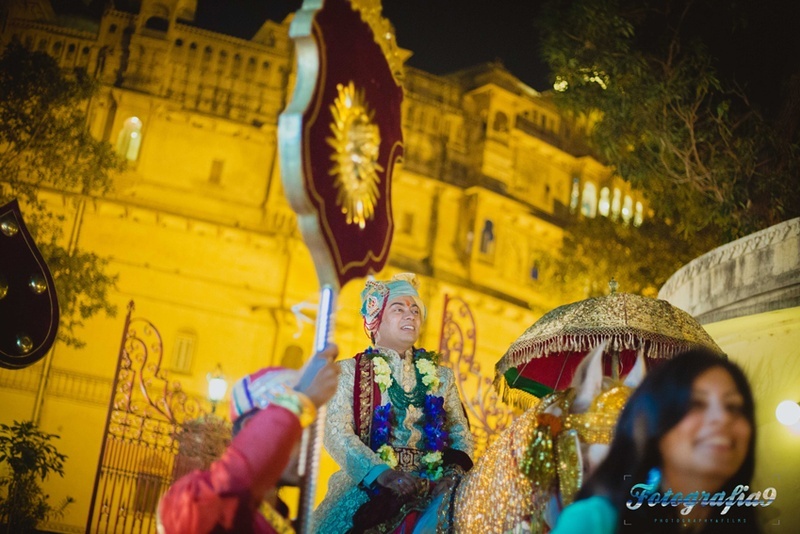 Entering their wedding venue in a regal style!